It has been a pretty hectic couple of weeks with the new edition of the Extreme series of courses at SuperMemo.com getting prepared to be launched. And it is finally here! The intensive vocabulary courses for learning four languages: English, German, Spanish and French, on all levels, are now available, and the update for our current users will be free of charge. There is more! Apart from upgrading our SuperMemo.com online courses, we have also added the new features to SuperMemo.com apps. So, what’s new in the Extreme courses? The most important benefits for our users who learn with the Extreme courses in the SuperMemo.com technology include the ease of use that makes it possible to study with the same course on various devices, also mobile ones, and at the same time fully synchronize one’s progress. Courses in the SuperMemo.com technology can be used online via a web browser, and can be also downloaded to an application for PC Windows computers and mobile apps for iOS and Android (available for download here, as well as in Google Play and App Store). Once you have downloaded a course to your device, you can use it both offline and online. Internet connection is required for correct synchronization. What does this give you? With SuperMemo, you can now learn anywhere and anytime, even on several devices. For ex ample when you are on the underground or on a walk, at boring meetings or lectures. Just don’t get caught! Learning vocabulary has never been so convenient and effective! Mobile technologies are now combined with the original SuperMemo method of spacer repetition, so appreciated around the world. 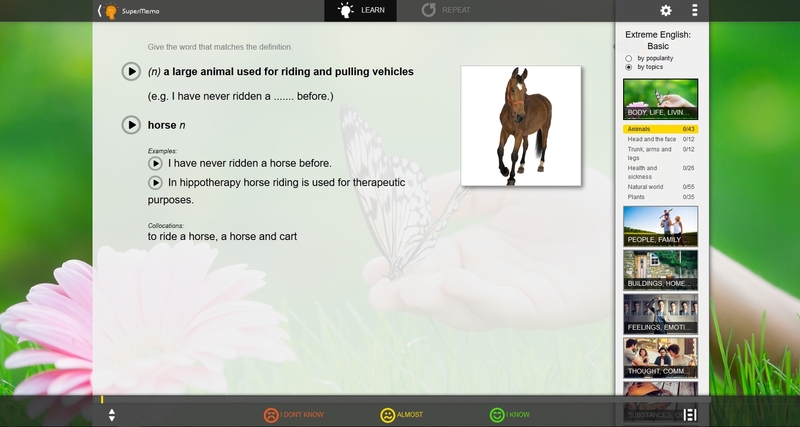 With the method, the new Extreme courses will allow you to remember thousands of words with almost 100% effectiveness! So far, words in the Extreme courses have been ordered by frequency. This meant that words which are used in the language most often, and thus are most useful for learners, were displayed first. However, our users used to ask us if it would be possible to order the words by topics. The reply seems obvious – yes, let’s try this! 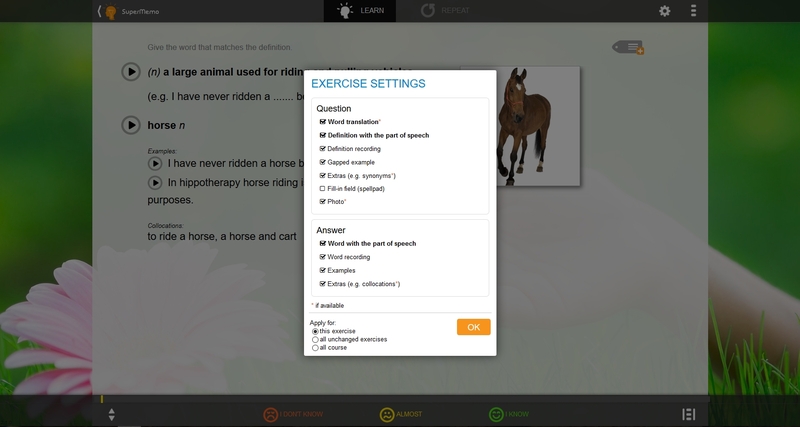 We created a switch that you can use to choose your preferred order for learning new vocabulary. You can either learn by frequency, or select the table of contents by topics if this is how you like to learn. You can also change your mind anytime, and switch between the tables of contents at any given moment. The tables of contents by topics includes themes such as: life, nature, house, feelings, entertainment, work, science, society, transport and abstract notions, to name just a few. Check these out by yourself! We have received feedback from our users who tell us a lot about their individual preferences on how they would like to design their words for learning in the Extreme series. Some of you would like to have definitions displayed, while others prefer just gapped sample sentences. Some of you like to have the full set of information displayed, yet others prefer the minimum – just the word and its translation. How can we match everyone’s preferences? With the new edition of the Extreme series, we would like to introduce the exercise configuration feature to you. The configuration will make it possible for you to individually decide what elements you will have displayed for each exercise in the course. You are free to switch off and on photos, sample sentences and definitions, and thus create your own favourite set of information that allows you to remember the new words most effectively. Give it a try!